“Sweet” because no people group on earth is any more passionate for their God than the Jewish people. There are those who visit the wall every day, praying fervently to the God of Israel, and desiring to connect with Him. “Bitter” because most are “so close, yet so far” from recognizing the Jewish rabbi named Jesus who came as their Messiah. Luke 19:44 tells us they “did not recognize the time of their visitation.” But one day they will recognize Him and the wall will be but a shadow of the real thing! Today, however, to go there is a very great privilege. But, for those who may never be able to go to the Western Wall in Jerusalem, the Israeli Antiquities Authority has brought a large piece of the wall (and about 800 other artifacts) to the US! 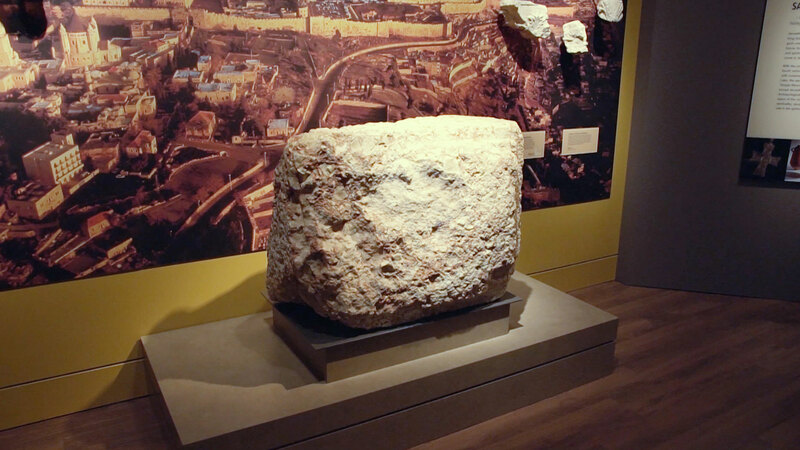 Now housed in the newly-opened Museum of the Bible in Washington DC, a one-ton stone from the Western wall is on display, and visitors are encouraged to actually touch the stone to “connect” to what it might be like to be at the wall. Another “connection” to Israel is the mock village of Nazareth, the boyhood home of Jesus. With its realistic look and feel, including staff members dressed as citizens of Nazareth in Jesus’ day, the Bible comes to life as one examines what life in that small village was like. I am most grateful to the Museum of the Bible, as they are active co-sponsors of Christian Leaders Seminars hosted by Christian Friends of Yad Vashem. (Yad Vashem is the Holocaust Museum and Research Center in Jerusalem.) By the grace of God, I was invited to attend one of those seminars a couple years ago and it greatly bolstered my knowledge and understanding of the Holocaust and modern-day treatment of the Jewish people. During our annual refreshers in Washington DC, I had the honor of touring the Museum of the Bible twice (before it opened to the public) and can attest first-hand to the quality of the museum. If you have the opportunity to travel to Israel, by all means do so! However, if that is not possible, I urge you to visit the Museum of the Bible in Washington DC. The 480,000 square foot Bible museum obviously houses much more than Israel-related exhibits. However, the “touch of Israel” is significant and the museum is absolutely incredible. Don’t miss an opportunity to see it!